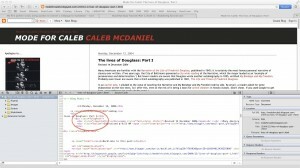 In my last Python post, I learned how to get a single webpage from one of my old blogs and convert it from HTML into Markdown. My objective, if you recall, is to take a list of posts from my old blog and convert them into an EPUB. I chose this task mainly to give me a reasonable goal while learning python, but I’m also thinking about some of the practical uses for a script like this. For instance, say you had a list of webpages containing primary source transcriptions that you wanted your students to read. A script like the one I’m trying to write could conceivably be used to package all of those sources in a single PDF or EPUB file that could then be distributed to students. The popularity of plugins like Anthologize also indicate that there is a general interest in converting blogs into electronic books, but that plugin only works with WordPress. A python script could conceivably do this for any blog. I’m quickly learning, however, that making this script portable will require quite a bit of tweaking. Which is another way of saying "quite a bit of geeky fun"! This short script accomplished a lot, but it also left me with a text file full of stuff that I don’t want in my final output. The urlopen line grabbed the entire webpage, including the blog’s title and all of the navigation links, but all I really want from each page of my blog is the main text, the post title, and the date it was originally published. Fortunately, one of the blogs I follow (by George Mason grad student Jeri Wieringa) recently had a good working tutorial on Beautiful Soup, a Python library that helps you scrape only as much data from a webpage as you actually want. Using a similar method, I isolated the title of the post (which happened to be inside the very first <h2> tag on the page) and the date of the post (which happened to be inside the very first <h3> tag). I assigned these strings to variables of their own, and then I started trying to pass my parsed results into Pandoc, just like I did with the whole webpage in my earlier example code. Once I solved that problem, most of the rest of the script was easy to put together using the lines I already had in my previous code. I did encounter one problem, though, which is an artifact either of the way I inputted my posts into Blogger originally, or the way that Blogger renders text. Instead of separating each paragraph into <p> tags, which is the well-formed-HTML way to do it, I found that many of my posts on Mode for Caleb have paragraphs separated by <br /> tags. The problem is that Pandoc interprets these tags literally, replacing them with a backslash character in the Markdown output. In a few tests I ran, I learned that this would cause problems down the road when I try to convert the markdown to EPUB. So I needed to get rid of the backslash characters. Drawing partly on one of the scripts Chad showed us last week, I did this using replace before writing the full text to a file. You can compare this with my old code to see what’s changed. So far things are proceeding well, but I’ve got a long way to go before I can turn a bunch of posts into an EPUB. For one thing, the linebreak problem I mentioned above is only the first of several bad HTML practices still lurking in the Blogger pages I want to convert. For example, sometimes italicized words are bracketed by <i> tags, and sometimes they are bracketed by <span> tags, which Pandoc doesn’t recognize. Luckily, I now know how to use Beautiful Soup to modify HTML tags and manipulate HTML in Python, so I’m beginning to see how the whole script will end up. I realize, by the way, that this entire posts assumes some working familiarity with HTML—if you’re interested in what I’m doing here, but don’t know much about HTML, let me know and I can help point you to some resources for getting started. The first line ensures that if down the road you end up using a python besides the system python, then you’ll still be good to go. The second ensures that the script is using utf-8 encoded strings. With that, you should be able to dispense with all those calls to the str() function.